For most, socially responsible investing means just that – investing in a manner that not only generates financial returns but also produces positive social value. But what does it mean for an investor to be “responsible” when selling their holdings? How does one stay responsible at the very moment when one ceases to be an investor? This is a basic challenge facing investors seeking to “exit,” i.e. sell their equity stakes to a new buyer. The issue isn’t entirely new. It first emerged in the mid-2010s, when several microfinance investment vehicles (MIVs) were starting to reach the end of their 10-year terms and were seeking to divest their assets. This issue was first addressed in the financial inclusion sector by a 2014 papercommissioned by CGAP and CFI, which first defined many of the key questions that socially responsible investors need to address when selling their equity stakes. The research – an investor survey, several in-depth interviews and a workshop during European Microfinance Week – found a mix of approaches applied by different investors. But these nevertheless shared many common elements aimed at making sure that the buyer will honor and pursue the social mission of the institution being sold. 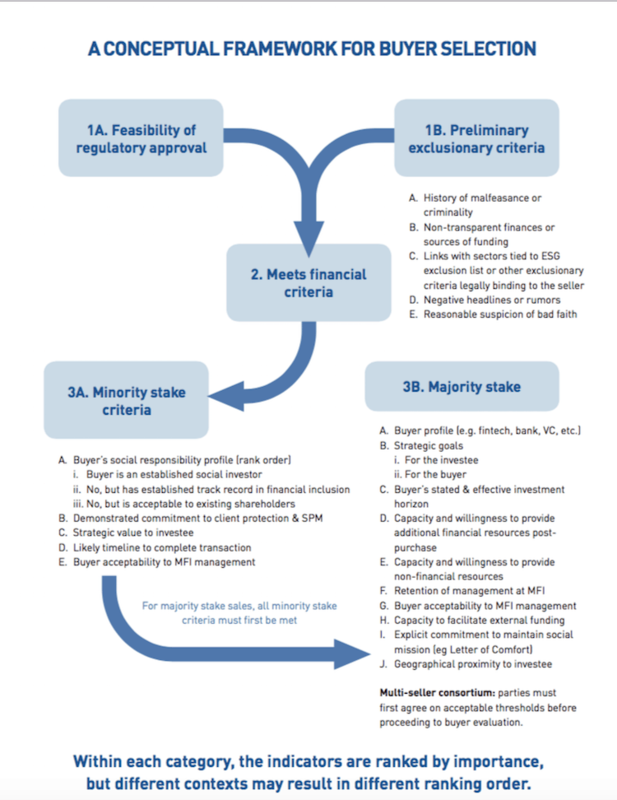 We consolidated these elements into a “Conceptual Framework for Buyer Selection” – a flowchart representation (plus explanatory notes) of the steps and criteria inherent in responsible buyer selection in microfinance equity exits. Overall, the consensus among investors was that social responsibility in the context of an exit largely means excluding those potential buyers who are deemed unsuitable and then applying the financial offer (how much a buyer is willing to pay) to select among those remaining. But that exclusionary process is driven by exceptionalism, i.e. buyers have to be obviously unsuitable to be eliminated from consideration, and such exclusions tend to be rare, based on factors like unclear ownership of the buyer, inability to trace the source of the buyer’s funds or suspicion of the buyer’s motives. And because such cases are rare, what this means in practice is that the financial offer is the dominant factor in the decision, much as in the world of purely commercial investors. We refer to this by a term borrowed from medicine, the First, Do No Harm principle. However, there was an important dissenting view among some investors, which holds that the Do No Harm exclusionary criteria are insufficient for a social investor. After all, a commitment to a social mission is a positive one; it must do good, and not simply avoid doing harm. In effect, this view seeks to invert the process, first deciding whether the financial offer meets the selling investor’s predefined financial objectives, then considering its value to the institution’s social mission. That value need not be strictly mission-driven, nor is there any expectation that the ideal buyers are socially motivated NGOs. Rather, the question is of organizational fit. Extending the medical analogy somewhat, we call this the Best Interests approach. We believe that this model, with its positive obligation on the seller(s), is better aligned with pursuing a social mission while delivering a reasonable financial return – which is at the core of the social investment value proposition. The framework consolidates the practices of different investors we spoke to but also advocates an evaluation process that moves beyond Do No Harm toward Best Interests while incorporating elements of both. It is structured so that questions are organized based on the type of transaction being contemplated: a minority or majority stake being sold, as part of a consortium of shareholders, or by a single investor. Are there exclusionary factors that mean the potential buyer is manifestly unsuitable; and, if not, is there any reason to believe that regulatory approval for the purchase would be difficult or unlikely? If not, is the initial, indicative financial offer within a predefined range that is acceptable to the seller(s) based on the overall double-bottom line objectives of the fund? If so, how does the proposed buyer, and its strategic objectives for the MFI, align with the social mission and the other best interests of the MFI? We hope this framework will serve as a resource for investors embarking on an equity sale. We hope it could also: help investors to brief external organizations that assist them in exit trajectories (investment banks, advisory firms, etc. ); assist new categories of impact investors that have little experience in exits; and serve as a guide to potential buyers to help understand selection criteria and prevent interested (but unsuitable) buyers from wasting time on a futile due diligence process. We hope too that it will inspire further work on an issue which, as equity sales continue to grow, will only increase in importance. Daniel Rozas and Sam Mendelson are co-authors of the joint NpM/e-MFP/FIEC research project on buyer selection in responsible exits. This blog was originally posted on NextBillion’s website.